Today is big. Today is very big. I'm sharing my top secret recipe for my signature sugar cookies. These cookies are the first thing I can remember fully making from start to finish on my own. I've been baking them up since I was 7! The recipe has evolved a bit over the years but the flavor remains true. I've made these for school parties, for friends, every year for santa, for sorority recruitment, and most recently for game day! My favorite memory is when I made them for my 4th grade Valentine's Day party in Mrs. Rains class. I spent probably 5 hours making them, but I refused to have any help. I proudly went to school with my sprinkle covered heart shape cookies with my hands completely died red and pink from the food coloring! Sugar cookies are completely underrated in my opinion. If someone were to ask me what my favorite kind of cookie was I'd say sugar cookies. If someone were to ask me to what my favorite thing to bake was, I'd say these sugar cookies. They are oh so special to me and my favorite things in the world! I posted about them when I first started blogging, but I wasn't ready to give away the recipe. I've matured since then and realized all good things should be shared. And not to mention my old post is so tragic it's embarrassing and had to be re-done. What makes these cookies so good are two secret ingredients. Are you ready? A little orange zest in the cookies and almond extract in the icing is what sends them over the edge. Follow below for some detailed instructions on how to make these perfect sugar cookies. In a large bowl, combine flour, baking powder and salt then set aside. In the bowl of an electric mixer, beat softened butter and sugar until a light pale color. Add the egg, milk, vanilla and orange zest and beat to combine. Place your mixer on low and gradually add your dry ingredients until the dough forms. Divide the dough in half, wrap in saran wrap and refrigerate for 1 to 2 hours. Or for the impatient, place in the freezer for 30 minutes. Preheat your oven to 375 degrees. Line two baking sheets with parchment paper or grease with cooking spray. Sprinkle your work space and rolling pin with powdered sugar. Using one wrapped package of dough at a time, begin to roll out into about 1/4-1/2 thick. Occasionally move the dough around to make sure it's not sticking. Cut out desired shapes and bake for 6-8 minutes or until just lightly brown around the edges. 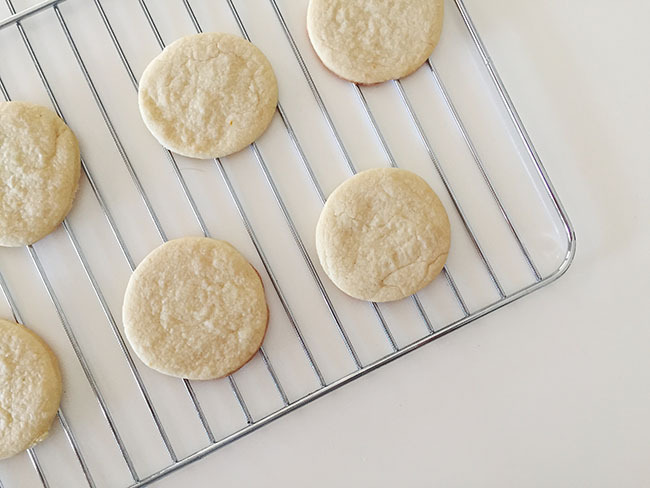 Let sit and cool on the baking sheets for a few minutes before you transfer them to a cooling wrack. Cookies must be completely cool before you ice them. I often stick them in the freezer to really firm them up! To make your icing, combine powdered sugar, meringue powder, almond extract and warm water in your electric mixer fitted with the whisk attachment. Beat for 8 minutes on low, scraping the sides occasionally. Your icing should be the consistency of glue. Divide into small bowls and add desired food coloring. Using the back of a regular table spoon, spread a little bit of icing just to the edges of each cookie. It's important not to use too much to where it spreads over the edges. To add decoration I love using little plastic squeeze bottles. The icing is the perfect texture to write and draw with, without being too runny. Let one layer dry before you use another color to decorate with. The royal icing will dry quickly. That being said, if you are using sprinkles, sprinkle them on quickly before the icing dries.